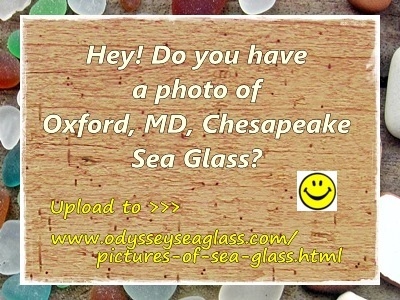 In Maryland, eastern shore of the Chesapeake Bay, north of Rock Hall and the mouth of the Chester River, south of the Sassafras River. 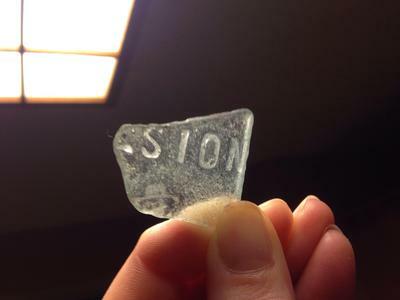 First, kind of hard to find this legendary sea glass beach. While it existed on my ancient maps, it did not exist on my ancient GPS. All reports suggested it was not exactly a public beach. We drove around for awhile, going down what turned out to be people's driveways, trying to follow the maps and the GPS westish toward the Bay. Finally flagged down a local guy pumping sewage or something... "Try going thataway... I think..."
Finally found the beach, a bunch of riprap (giant honkin piles of rock thrown there to prevent erosion, the Bay has no natural rocks) and a guy fishing. Beach would have to be accessed over vast mountain of rock... and the sign suggested we should not park there. Backed up the long dirt drive to a marina, found an open gate, drove into what looked like it might contain an office. Found local woman who suggested we could park in the back (since this was not a busy time, in the middle of the week)... "I don't think she'll mind..."
Parked close to the beach, easy walk out onto the sand. Scouted for portapottis first... none. Zilch. Nada. um, maybe I should throw it back to cook longer. I didn't and kept the hard found shiny ones too. 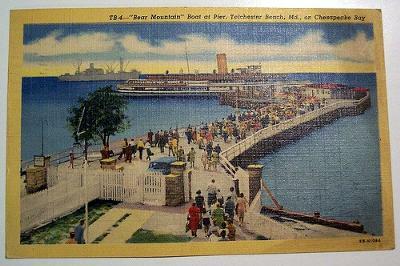 Between the two of us we found 3 or 4 dozen pieces in the hour or so we poked around. We did not stay longer because of the lack of portapottis. RUN AWAAAAAYYYYY! (Pottis available in Rock Hall, or, as we went north to Betterton, at their beach restrooms). We sort of expected larger pieces, which we did not find. We did however find a lot of small bits, and some very nice. Check in at the marina to see if you need a parking permit or something. 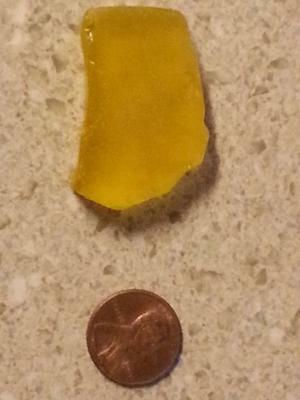 My friend poked around the feet of the riprap rocks and found glass caught in the rock crevices. 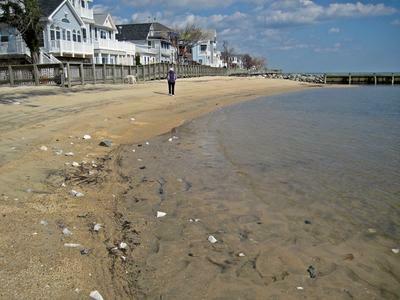 This is a quiet beach, facing out onto the Chesapeake Bay, so no high tides or surfing level waves. Sloping sand beach invites wading. Best seen in off hours when neither marina nor restaurant is busy. Just after a storm you might find more stuff. Also many nice bay pebbles, many clearish, apparently some kind of quartz. 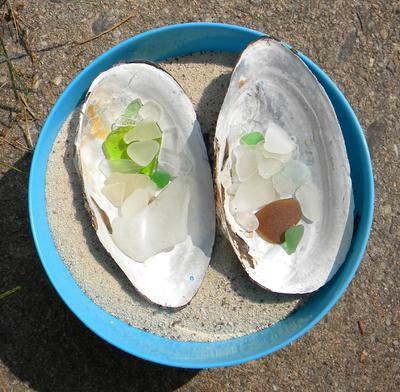 The small pieces of rock resemble sea glass. 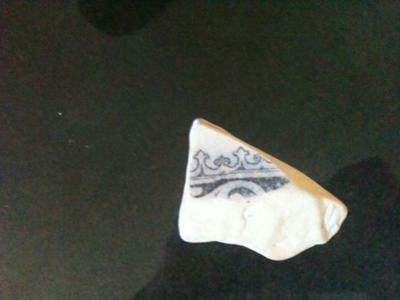 The very large white piece in my photo was found on another beach. Elk River in Cecil County, Md. I have been going to the beach at the marina for several years. I always go during the week in the morning or mid afternoon. No one has ever bothered me about parking there. 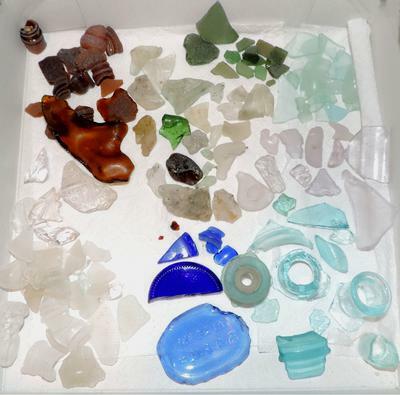 I have never found any large pieces of glass there but have found some nice smaller ones. I did find a piece with a star shape imprinted on it which I had it made into a necklace. 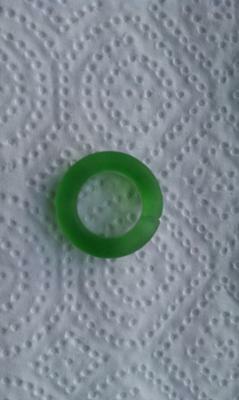 I usually only find green,brown and white and an occasional cobalt blue but very small pieces. Shame that after all the trouble that you went to, the results weren't what you would have liked. However great to see that you did find some pieces. Love the way you displayed them. 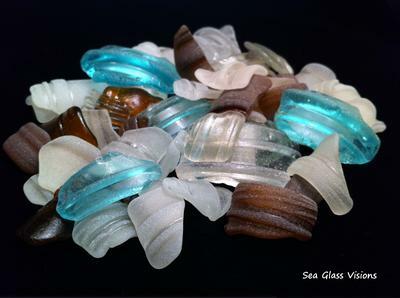 Look forward to hearing about some more of your seaglass adventures.